Two cars, two pedals, a lot of shared ingredients, but completely different recipes. Not too long ago, the answer to that question would be a lack of options. If you were a business executive with a lot of urban driving, getting a diesel car minus the clutch meant coughing up north of Rs 10 lakh. However, necessity being the mother of invention, we finally have more affordable alternatives. The need for a sedan with modest proportions birthed the compact sedan segment, while the need for an affordable autobox gave us the automated manual transmission. Join them both and you get the bedfellows we have here. It’s amazing how much these rivals have in common. Both source their engines from Fiat and their transmissions from Magneti Marelli. Tata was first to the sub-4 metre sedan game while Maruti aced the concept, and while the Zest was the first to offer a diesel AMT in the segment, Maruti was the first to offer the technology to the Indian masses altogether. What’s not common though are the design philosophies. Neither one offers styling that can draw any superlatives, but while the Dzire is slim-cut and edgy, the Zest is more curvaceous. With Tata’s new design philosophy, the Zest is also the more modern looking of the duo, but even so, the Indica characteristics haven’t been wiped away. What you do get is a quirky looking sedan with heap of character lines, a classy set of 15-inch alloy wheels, projector headlights with LEDs around them and more LEDs in the DRLs and tail lights. Contrarily, the Dzire’s styling is so neutral that it blends in anywhere. Save for the black tinted headlamps and a few chrome highlights, there isn’t much to talk about. It can’t turn heads like the Tata, but many prefer it that way. Step into the cabin, which you can do without touching the Dzire’s key thanks to the smart-key system, and it’s a similar affair. The cabin sports a ‘just enough’ philosophy in the Maruti. So while the beige-black interior palette with faux-wood inserts is pleasant, the design is showing its age. It is, however, a classy arrangement and the finish quality is good too. For a critic though, it gets almost irritating because there’s really nothing to fault. It’s a practical setup too and apart from a good amount of storage spaces being offered, you get a push button starter, a tilt-adjustable steering with mounted controls and a height-adjustable seat for the driver. The 6-speaker sound system can be used via the usual must haves (AUX, USB and Bluetooth) and of course, there’s automatic climate control too. Evidently, it’s not a barren feature list, and if you get a lot more, you’re either in la-la land or the Zest. The interior contributes greatly to the Zest’s packaging, so while it gets everything the Dzire does, it offers a better MID, the better sound system and Harman’s ‘ConnectNext’ touchscreen infotainment system. The black and beige-ish interior is refreshing and the design team was certainly allowed certain liberties. The quality and attention to detail is appreciable too and bits like the chrome touches on the AC vents and climate control knobs or grade-above quality buttons in the centre console massage the ego ever so gently. 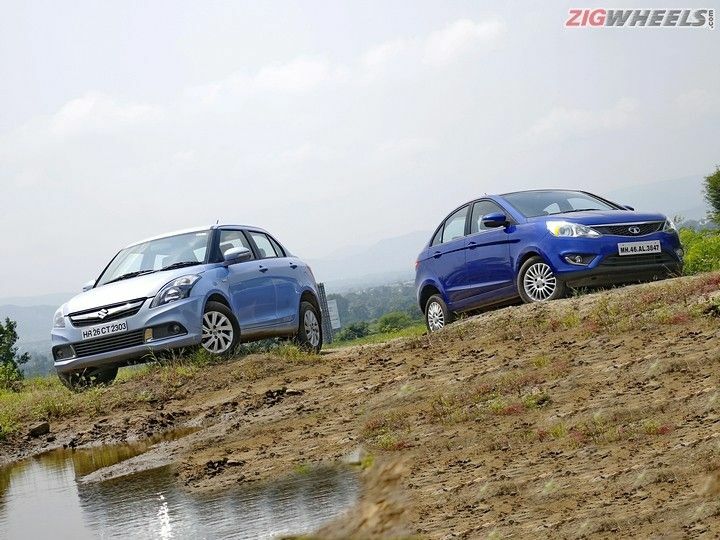 Both cars offer good ergonomics, but the Zest offers better overall space especially at the rear. While the interiors offer different strokes for different folks, the driveability factor changes the game. Yes, both get the same 1.3-litre diesel engine, but while the Dzire AMT makes 75PS of power and 190Nm of the torque, the Zest AMT makes 15PS and 10Nm more. Does it translate on the road? I’m afraid not. You see, the Zest may have more oomph on paper, but it also weighs more and the performance just feels dull. The throttle response isn’t immediate and there’s evident turbo-lag. The gearbox is typical AMT fare and the shifts are noticeable, but not jerky when driven with a light foot. What grinds my gears though is the lack of a creep function. The Zest doesn’t really start moving before 1,500rpm and in stop-and-go traffic that results in choppy progress, since you have to keep shuffling between the accelerator and brake. The engine does offer good mid-range performance though and the manual mode helps you build the revs when it’s time to hit the hill-sides or make an urgent overtake. The engine-transmission combination in the Dzire ‘AGS’ though, is a marriage made in heaven. Unlike the Zest, it doesn’t feel lazy before the turbo spools and it’s quite lively off the line. The powertrain feels more intuitive too and the transmission’s kick-down and upshift times are surprisingly quick for an AMT. Gear changes feel smoother too and while both cars can hit triple-digit speeds with ease, the Dzire just makes the job a more relaxed affair. I also like how its AMT is a rare gearbox that isn’t too defensive. Engage manual mode and you can rev the engine till kingdom come, but there’s no auto-upshift, just in case you were interested in hooning about a bit. Sportiness isn’t the first priority for a buyer in this segment, but the Dzire’s steering is direct, communicative and engaging too. It’s one of the reasons why the Swift itself is quite an enthusiast pleaser. The ride quality, however, is quite stiff and therein lies the Zest’s advantage. The Tata offers superior ride quality and bad road ability. Combined with the more spacious cabin, it makes a stronger case for the chauffeur driven lot. Why do I say this? Well I wrote part of this report in the back of the Zest and the other in the Dzire’s second row and know fully-well where I’d rather be! Both cars manage to offer something unique in the segment, but boil it down to the mechanicals and there’s little doubt left in our minds. The Dzire AMT’s driveability in the city or on the highway is appreciably better. Add to that the fact that the Dzire nameplate is to cars what Maggi is to noodles and the package is as close to can’t-go-wrong as it gets. The Zest, on the other hand, is the more feature-loaded option of the two and gives you a great deal of the feel good factor. Tata has gone the extra mile to give the Zest segment-firsts, but the core package still needs some polishing. The Dzire is the better diesel automatic to drive every day and comes with Maruti’s bulletproof brand backing. The Zest adds a lot of cherries on top, but the Dzire is the cake we’d bite into. Share your experiences with Swift Dzire? Confused about Maruti Suzuki Swift Dzire?